Do not hesitate to contact us in case you experience issues or cannot find answers to your questions within our help section. 1) ServicePoint: You can send in a ticket 24 hours a day. You will receive a reply as soon as possible. It is important that you list your username and question clearly in your report. Make sure you elaborate. The more information we have, the better the answer we can give you. Reports that consist of rude language or threats will not be responded to. 2) Chat lobby: You can address a 'GamePoint' employee when this employee is online. GamePoint employees can be recognized by the 'G' in front of their name. Keep in mind that sometimes employees are busy testing and might not respond. Keep in mind that messages about problems that occurred more than one weeks ago will not be prosessed. So remember to notify us in time. Where can I find the game rules? The objective and basic rules of all games can be found in our game information help section. How do I add friends to my friend list? 1. The easiest and quickest way is to click on a player’s name within the chat and select ‘add to friendlist’. 2. The second option to add a friend is to hover over a player’s name in the roomlist. You’ll get a nice overlay where you can click on the icon with the green plus sign to add the player to your list with friends. 3. The third option is to click on the icon with the plus sign in your current friendlist. Afterwards you can write the name of the player you would like to add. What are XP, Levels and Medals and how does it work? With every game you play you build up experience points (XP). When you have enough experience you will level up. A level indicates how experienced you are in the game itself. You will also be able to gain medals whilst playing. These medals can be displayed in a showcase for other players to see. More information about XP, Levels and Medals can be found in the game information help section. When do I receive a coin gift? There are a variety of gifts handed out freely by GamePoint. The most well-known gift is the 3 hourly gift. This gift will be handed out on a 3 hourly basis to every household that logs in into one of our games. Other gifts include a welcome gift for new players, gifts send by your friends and gifts that can be obtained by participating in events and on our Facebook pages. All gifts can be found in the GamePoint Wallet. More information about the daily gift and the conditions can be found in the Coins & Membership help section. How do I purchase coins or memberships? Click on one of the ‘deposit’ buttons in our games and it will open up our coin and membership shop. You can choose between coins or memberships at the top of the shop and select the item you would like to purchase. After you made a selection a variety of payment methods will appear. Some selections do not include all payment methods. In case you don’t have the required payment methods available to you, try to select another item. Please do not hesitate to contact us if you have any questions about a purchase. How long does it take before I receive my purchase? Purchases are normally instant, however some payment methods are known to take a bit longer. If you haven’t received your purchase within 24 hours chances are something went wrong. Please do contact us in that case. What are the system requirements to play on GamePoint? Roughly said, any computer with an internet connection would be sufficient. However for our recommendations please have a look at our Minimum requirements. Which games can I play on mobile & tablet? GamePoint Bingo, WordTornado, RoyalDice & CardParty are currently available on the iPad (version 2 and onwards). Bingo can also be played on an iPhone or Android phone. We are working on more games which should become available for mobile and Android devices as well. We will update this question when things change. What to do when the game doesn't load? There are several explanations why a game would not load. The most common loading issue has to do with outdated software. How to update Adobe Flash Player is explained in the system requirements. If the issue still exists after updating your software please contact our Support Team. What are the best ways to prevent connection issues? The usage of a wired connection tends to solve most of the issues we’ve encountered. We understand this issue could be hard to solve, and therefore we have written a handful of suggestions to improve internet connections. See here for more information. How do I change my personal settings such as password and e-mail? When you are playing on our website, www.gamepoint.com, open our Servicepoint by clicking on contact or on the FAQ. From there you select 'account' and go to your 'settings'. Here you can adjust all your private settings. When you are using our Facebook apps we will automatically update your e-mail address and information such as gender & Date of Birth. 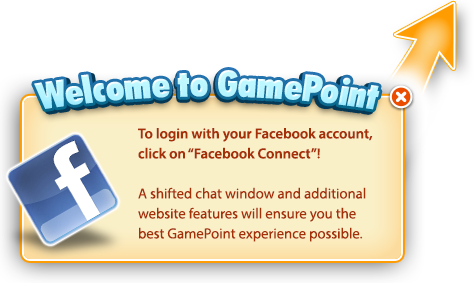 When you are playing on our website, www.gamepoint.com, open our Servicepoint by clicking on contact or on the FAQ. Here you can remove your current photo or upload a new one. It could take up to ten minutes before your new photo is visible to all your friends in game. When you are using your Facebook, we will automatically update your photo when you change it on Facebook. There 2 ways to send a private message. Click on the player in the chat and select “Private message”. Hover over a player in your friendlist or in the roomlist and select the small chat icon at the right bottom or double click on the player’s name. A private conversation will be started. How do I block or report another player? When a player shows inappropriate behavior we always advise other players to report this person and block his or her chat. You can report a user by clicking on his or her name and select the option “report user’. It will send our team a notification that this user has shown inappropriate behavior that we should review. In the mean time we always suggest to block a player so that you’re no longer being bothered by his or her chat behavior. Blocking a user can be done by simply typing /block username (e.g. /block John4) in the chat, or by clicking on the user in the chat and selecting the “block user” option. Where do I apply to become a host or tester at GamePoint? Thank you for your interest! That’s really fantastic! Hosts and testers are very important to GamePoint. They make GamePoint as great as it is now. If you feel you are up to the task have a look here, apply and you might become our next host or tester.